My bride and I have a tradition. 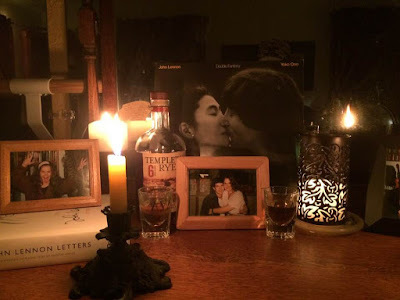 Every December 8th, we pull out the 1980 release Double Fantasy by John Lennon and Yoko Ono, listening as we read through some Lennon memorabilia and offered a toast. We were 10 years old when John was killed. For me growing up in the 1970s, John is my favorite Beatle and has remained one of my greatest influences in my life. While his death was felt throughout the world-- The Death of this Symbol John represented in his public persona, a persona which influenced my outlook -- It pales in comparison to that pain of loss, that grief and the trauma of experiencing the assassination of the one you love, the father of your child, your artistic collaborator. Whatever outsiders think of Yoko...only John and Yoko truly understand their relationship. Given that I do not know their relationship, what I say here might be way off base. But it is what I sense. My perception of John Lennon is that he was a perpetually growing artist, a human being finally understanding the truly important lessons of Life in his last 5 years on this Earth. It is my view that he always considered himself an artist first, that his true personal love was in creation and expression that desired to pursue the same artistic path of his friend Stu Sutcliffe. It just so happened he also liked Rock n Roll and was very good at absorbing an eclectic mix of music and then recombined them into something new. In the process being open and honest about his joys, his loves, his flaws and his pain. Yet there was always this hope, and acknowledgement it seems he was saying, "Listen Everybody, I am a human being. I F*ck up a lot of the time, but I am trying to be better all of the time. Please do the same." This is really a lot how I feel, and I suspect everybody feels. The worst feeling in the world is causing pain to others, especially the one to whom you dedicate your life. When I turned 34, my wife and I had our first born. Because of our career circumstances, it made sense for me to be the at home parent while she worked. I threw myself into it...putting off my own graduate studies and career aspirations to give my son, and my daughter, born 21 months later all of my love and energy. I spent so much time introducing them to the world, and listening to them, and encouraging their explorations. I feel I was comparably the same point in my life as John when he and Yoko had Sean. And that revelation hit me when in 2010, when I threw together a John Lennon 70th Birthday celebration featuring my Augsburg University rock ensemble students. My wife and children were in the audience, and it hit me, that I am now 6 months older that John was when he was killed. Thinking about my wife, and how much more I want to teach my children there is. And feeling sad for Sean, for Yoko, and John -- he seemed to enjoy "the meaning of success" - ie being a good parent and spouse. Well, on June 1, 2017. My bride was suddenly ripped from us in a brutally fatal collision caused by a drunk driver who was on supervised release from prison. 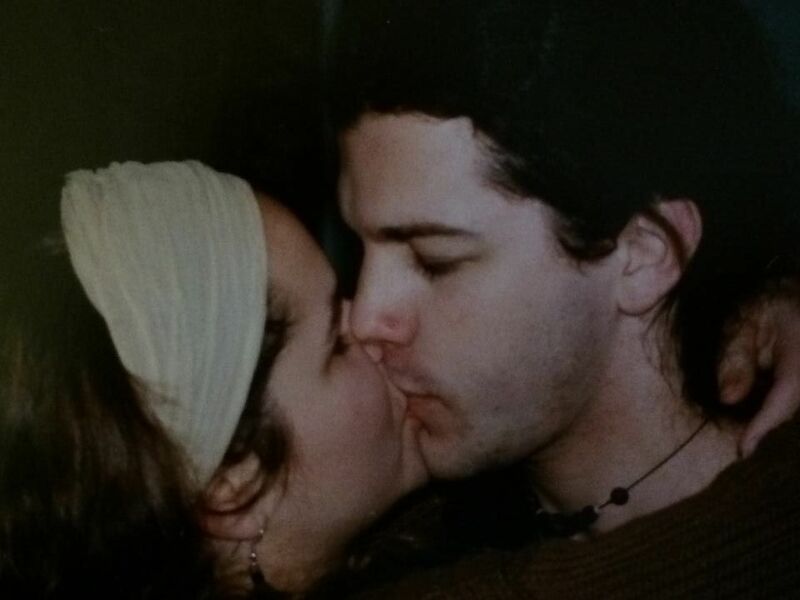 We were so completely in love - But our marriage was not perfect. Plenty of times when we p*ssed each other off - fortunately we were always able to talk and listen to each other. The night Krista was killed we were both scheduled for our Minnesota Chorale Auditions - We looked forward to the 2017-2018 season once again singing together with the Minnesota Orchestra. She was learning how to play mandolin so that we could perform publicly together in creative capacity. - We were on such a loving upswing in our relationship. I feel some relation with where it seemed John and Yoko were, listening to their collaboration - the back and forth of a true love relationship that Double Fantasy represents. So when I see John's relationship with Yoko, I see someone who found a soul-mate; found the one who truly understands his heart, that he is a more valuable human being than any popular perception people have of him. And those who dare malign his wife, don't know what they are talking about. My wife had been unfairly targeted her entire career. She was a being full of Love and Caring and Wisdom - so my attitude has always been to screw those who malign my wife because they do not know her at all! Please remember that John Lennon is a human being, not an image, not a shadow not even a Beatle just another soul trying to figure things out and cut through the BS of needless hang-ups. Thank you John.